Canadian astronomers have identified mode changing and giant pulses in the millisecond pulsar known as PSR B1957+20. 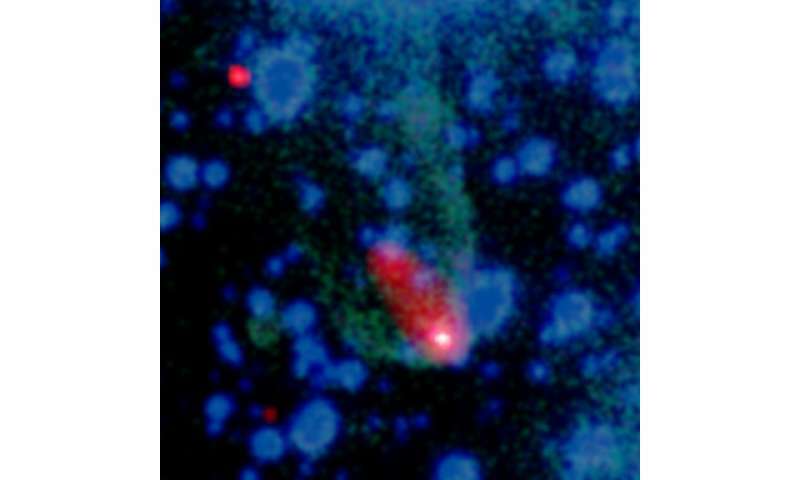 It is the first time when mode changing mechanism has been observed in a millisecond pulsar. The finding is detailed in a paper published July 4 on the arXiv pre-print server. Radio pulsars showcase various variability in emission ranging from extremely short bursts like giant pulses to long-term changes in their emission profiles. Some of them exhibit even mode changing where the emission profile switches between two or more quasi-stable modes of emission. To date, mode changing has been only observed in normal pulsars. However, a recent study conducted by a team of astronomers led by Nikhil Mahajan of the University of Toronto in Canada, shows the mode changing process could be also present in millisecond pulsars, as they observed that the pulse profile of pulsar PSR B1957+20 switches between two modes. Discovered in 1988, PSR B1957+20, also known as the "Black Widow Pulsar", is a 1.6 ms eclipsing binary millisecond pulsar in the constellation Sagitta. It orbits with a brown dwarf companion with a period of 9.2 hours with an eclipse duration of approximately 20 minutes. Mahajan's team observed this pulsar for over nine hours in four daily sessions between June 13 and 16, 2014 at the Arecibo Observatory in Puerto Rico, what resulted in uncovering new insights into its behavior. "Here, we show that the millisecond pulsar PSR B1957+20 shows mode changing, and that the properties of the giant pulses that we found earlier (in the same data; Main et al. 2017) show correlations with the modes," the paper reads. According to the study, PSR B1957+20 switches between two modes, with a typical time between mode changes of only 1.7 seconds, or approximately 1,000 pulse periods. This is the shortest time between mode changes in pulsar observed so far by astronomers as in regular pulsars these timescales range from minutes to even weeks. The two modes observed in PSR B1957+20 differ in both intensity and circular polarization. They were tagged "high" (more energetic) and "low" (less energetic). The researchers found that the pulsar is in the high mode about 60 percent of the time and in the low mode about 35 percent of the time. The remaining 5 percent of the time was assigned to transition between the two modes. Furthermore, observations conducted at the Arecibo Observatory allowed the astronomers to detect 1,715 giant pulses in PSR B1957+20. They found that the distribution of giant pulses with pulse phase is correlated with mode changing. "We also find that the properties of the giant pulses emitted by PSR B1957+20 are correlated with the mode of the regular emission: their rate and the rotational phase at which they are emitted both depend on mode," the researchers wrote in the paper. However, the authors of the study noted that additional follow-up observations of PSR B1957+20 at different frequencies are needed to shed some light on the causes of mode changing and giant pulses in this pulsar. Many radio pulsars have stable pulse profiles, but some exhibit mode changing where the profile switches between two or more quasi-stable modes of emission. So far, these effects had only been seen in relatively slow pulsars, but we show here that the pulse profile of PSR B1957+20, a millisecond pulsar, switches between two modes, with a typical time between mode changes of only 1.7,s, the shortest observed so far. The two modes differ in both intensity and polarization, with relatively large differences in the interpulse and much more modest ones in the main pulse. We find that the changes in the interpulse precede those in the main pulse by ∼25 ms, placing an empirical constraint on the timescale over which mode changes occurs. We also find that the properties of the giant pulses emitted by PSR B1957+20 are correlated with the mode of the regular emission: their rate and the rotational phase at which they are emitted both depend on mode. Furthermore, the energy distribution of the giant pulses emitted near the main pulse depends on mode as well. We discuss the ramifications for our understanding of the radio emission mechanisms as well as for pulsar timing experiments.